Halifax coach Richard Marshall saw his side deliver on their pre-match pledge as they surged to a memorable and potentially crucial 32-24 derby win over Bradford Bulls at Odsal. Fax’s victory, secured via a dominant second half performance after they led 12-6 at the break, lifted them to third on the Championship ladder and tipped their full-time neighbours - whose playing budget is estimated to be at least double Marshall’s annual spend - down into fifth. And it was achieved against the odds, with Fax losing form centre Ben Heaton to injury after three minutes and back rower Matt Sarsfield just after half time, leaving Marshall short of interchange options. Heaton departed on a stretcher after being knocked out, with play stopped for 13 minutes while he received treatment. “It was a tough game, and I thought we handled that aspect really well,” enthused Marshall, who has now delivered four straight derby wins. “We talked about taking the game to Bradford in the build up and we delivered on that. “That’s the important thing, not just talking about it, but doing it on gameday. “We’ve talked a good game at times this year and not delivered and fallen down, but we didn’t today. “Our levels rose and the players should be, and are, very proud about that performance. “It’s a big win for us; there is still a long way to go this season but the performance was significant, especially with 15 men. “We lost Ben after three minutes and Matt just after half time and we had a few guys out there who’ve not played much football recently. “If you take all that into account it was a very good, probably outstanding, performance. Marshall said it was unlikely that Heaton would be considered for a place against Swinton next Sunday (3.0), with Ed Barber - who filled the centre spot for 77 minutes and scored Fax’s last try - the obvious alternative. “Ben was knocked out, but then we all saw him walking away from the ambulance,” said Marshall. “He has gone to hospital now, because we need to make sure he is okay. “The medical staff from both teams were fantastic, they looked after him very well. “I think it would be very unlikely he’ll play next week, regardless of head tests, it was a hefty knock he took. 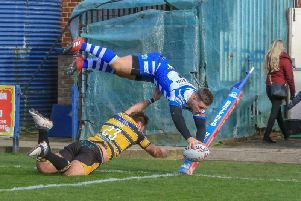 Fax had stars across the park, but it was hard to split strutting half back Gareth Moore, prop Adam Tangata and Ben Johnston, who produced easily his best game as a full back after being preferred to established number one Miles Greenwood. “Johnno’s selection was justified this week, Moore was very good, Tangata was very good and you can throw Will Sharp and James Saltonstall in there as well,” said Marshall. “We had players who had to do a lot of extra work and they did it well; you can’t practice that, it either happens or it doesn’t.